Bluffton’s Averey Rumer and Spencerville’s Jayden Smith go after a loose ball during Thursday night’s game at Spencerville. 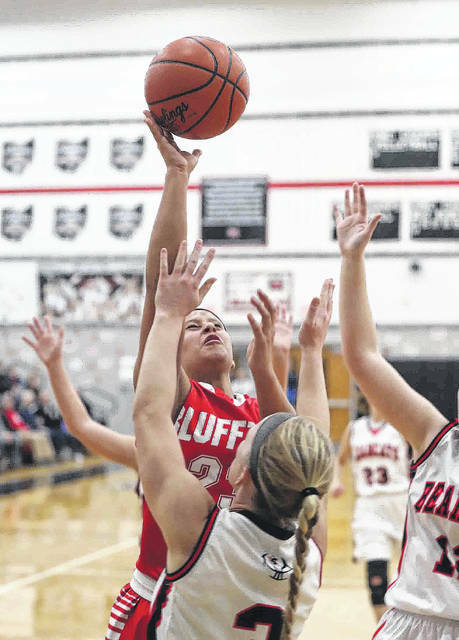 Bluffton’s Alivia Koenig puts up a shot against Spencerville’s Kaiden Grigsby during Thursday night’s game Spencerville. 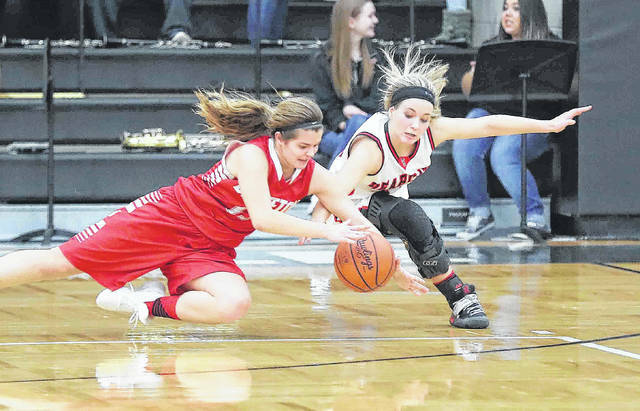 SPENCERVILLE — Coming into the showdown with Bluffton on Thursday, Spencerville, with one loss in the Northwest Conference, needed a win to keep their conference title hopes alive against the Pirates who sported an unblemished record in the NWC. If Spencerville was going to win it would need to stop first-team all-NWC Alivia Koenig. The Bearcat duo of Kelsey Shaffer, sophomore, and Jayden Smith, senior, were called upon to do the job defensively and they came through by blanketing the talented Pirate and limit her to 10 points and help Spencerville to a 55-50 victory. With the win, Spencerville improves to 7-5 and 3-1 in the NWC. Bluffton falls to 10-4 and 4-1 in the league. With the pep band on hand, a larger than usual crowd and cheerleaders, Spencerville was pulling out all the stops to enhance its home court advantage and from the onset the Bearcats came game out the locker room like postseason had already begun and opened a 13-3 lead to start the game. Bluffton head coach Eric Garmatter said this was a tough loss. Undeterred by Spencerville’s initial offensive spurt, the Pirates would rally and for the next three quarters the two teams engaged in a tight defensive struggle that saw neither team open up a lead bigger than eight points. Despite Koenig being smothered by the pair of Shaffer and Smith, Bluffton, thanks to its defense and the offense of Avery Rumer and Libby Schaadt, the Pirates held a 43-42 lead with two minutes left in the game. But down the stretch, it was Spencerville, who outscored Bluffton 11-5 to claim the win. In that last two minutes, it was the Bearcats’ Melanie Koenig who got the hoop and harm to open up a four point lead, 47-43, and the Bearcats never relinquished. In the second half, Alivia Koenig would be held to four points. Rumer, who scored all her points in the second half, finished with a team-high 12. Kayle White added 10 points. Garmatter said the Bearcats did a great job but pointed out that the Pirates hurt themselves with turnovers. For the game, Bluffton finished with 15 turnovers including two crucial ones in the last four minutes. Spencervillle’s Kaiden Grigsby led all scorers with 16 points and recorded a clutch 3-pointer in the fourth Smith, who did the job defensively, chipped in 10 points. Ekis said his girls have plenty of basketball experience and did not panic in the final minutes of the game. This entry was tagged Bluffton, Spencerville. Bookmark the permalink.